One of the trends that’s developing is a neo-Reformed neo-Calvinism, which I began touching upon a while back e.g. in Confusion Concerning Calvinist Spirituality? As I said in recent posts such as Acts 29 Network And Reformed Counter Reformation Spirituality? and Acts 29 Pastor Matt Chandler On Being A Reformed Charismatic, in my estimation, there’s very good reason for concern because these people are rapidly growing in popularity and influence, particularly so within the younger sector of the Reformed Camp; blessed as they are by Dr. John Piper, who’s seen by some as a “pioneer” of this New Calvinism. Then in Spiritual Disciplines According To Martin Luther I connected some more of the dots for you concerning the Acts 29 Church Planting Network itself where you heard from Darren Patrick, its own Vice President, that they are a “neo-Reformed” section of the Emerging Church. Let me be perfectly clear: Acts 29 is most certainly not heretical in its basic theological beliefs; the concern here is the recommendation of Counter Reformation spirituality of CSM, a key component that was hidden within the Trojan Horse of the EC progressive/liberal de-formation of the Christian faith. At the end of the 20th century, Benedictine monk John Main pioneered a Christian form of meditation that was influenced by his study with a Hindu master. He taught a form of meditation using the word maranatha (Aramaic for “Come, Lord”) as a mantra. Sitting cross-legged, the meditator chants (either aloud or silently) “ma-ra-na-tha” for 20 minutes daily. The teachings of Brother Main and others became so popular that the Vatican’s Congregation for the Doctrine of the Faith issued a letter to all Catholic bishops in 1989, entitled “Some Aspects of Christian Meditation” to guide the bishops in their leadership of churches that were using meditation. So now you have a much better idea of what Gary Thomas, recommended by neo-Reformed New Calvinist Mark Driscoll, is leading his readers into in his book Sacred Pathways (SP). As I’ve said before, I happen to have SP and, the fact is, that chapter 9 is a veritable ode of praise for contemplatives. And below we have more reason for concern with Mark Driscoll and his emerging neo-Calvinist Acts 29 Network recommending corrupt contemplative practices of the very CSM which flowered in the anti-biblical monastic traditions of apostate Roman Catholicism and is counter Sola Scriptura. Medieval mysticism has managed to survive within small pockets of Roman Catholicism for centuries but has gone largely unnoticed by evangelicals. It is true that a few groups, such as the Quakers, have always kept some aspect of mysticism within range of evangelical awareness, and elements of mystical practices have actually thrived in charismatic circles right down to the ranks of Fundamentalism. But classical mysticism was virtually unknown in Evangelical circles until 1978 when Quaker minister Richard J. Foster published Celebration of Discipline, the Path to Spiritual Growth. Um, what? 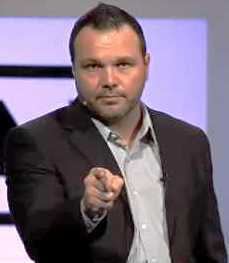 Well now, perhaps Emerging Church pastor Mark Driscoll now wants to take us into the postmodern Wonderland of Humpty Dumpty language where words are warped to mean whatever the speaker wants them to mean. That’s why, in my opinion, new Calvinism is actually a postmodern form of Calvinism; where Calvinists can claim to hold to Reformation theology, while also embracing the Counter Reformtation spirituality that Protestant Reformers like John Calvin clearly rejected. Now if you’ll excuse me, I think I’m going to take a long swim upon my nice dry, warm, icy pool for a minute. Tony Jones, Sacred Way: Spiritual Practices for Everyday Life [Grand Rapids: Zondervan/Emergent YS, 2005], 215, emphasis mine. Richard Foster, Emilie Griffin, Spiritual Classics [San Francisco: Harper One, 2000], 155, emphasis mine.